For anyone wondering how Versailles might look had Marie Antoinette economised and not lost her head to the guillotine, look no further than Schloss St Emmeram in the Bavarian city of Regensburg and its current matriarch, Princess Gloria von Thurn und Taxis. The ancestral palace of her late husband, Prince Johannes von Thurn und Taxis, is an architectural melting pot of Romanesque–Gothic, neo-Renaissance and Rococo architectural styles — and, with more than 500 rooms, one of the largest private residences in Europe. According to the princess, the sprawling schloss “makes Buckingham Palace look like a hut”. 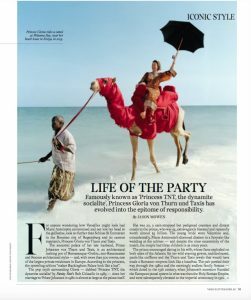 The pop myth surrounding Gloria — dubbed ‘Princess TNT, the dynamite socialite’ by Vanity Fair’s Bob Colacello in 1985 — since her marriage to Prince Johannes in 1980 is almost as large as the palace itself. She was 20, a cash-strapped but pedigreed countess and distant cousin to the prince, who was 53, extravagantly bisexual and reputedly worth almost $3 billion. The young bride wore Valentino and, coincidentally, Marie Antoinette’s diamond diadem in a fairytale-like wedding at the schloss — and despite the clear eccentricity of the match, the couple had three children in as many years. The prince encouraged daring in his wife, whose fame exploded on both sides of the Atlantic for her wild evening gowns, multicoloured, punk-like coi ures and the Thurn und Taxis jewels that would have made a Romanov empress look like a hausfrau. The pair partied their way through the 1980s and the seemingly endless family fortune — which dated to the 15th century, when Johannes’s ancestors founded the European postal system in what was then the Holy Roman Empire, and were subsequently elevated to the imperial aristocracy in 1512. If Gloria moulded her ‘party girl’ persona to assuage her husband’s eccentricities, two aspects of the princess’s life were resoundingly her own — her newly acquired passion for contemporary art and her devotion, paradoxically, to the Catholic Church. “Even when I was going to Studio 54, I was still attending church… maybe just not the early mass,” she once said. She began collecting contemporary art after meeting Keith Haring in the early 1980s, and his work, alongside that of Andy Warhol, Je Koons and Julian Schnabel among others, soon enlivened the gilded boiseries of the schloss. However, no artwork outshone Gloria, nor the million-dollar 60th birthday bash she threw for her husband at St Emmeram in 1986. “Titles were a deutsche mark a dozen,” wrote Bob Colacello of a three-day a air that included a white-tie-and-tiara dinner; a ponti cal mass at which the princess received communion wearing a witch’s hat; a lobster luncheon followed by a parade of 5000 Thurn und Taxis subjects dressed in full Bavarian regalia; cocktails, reportedly delayed due to the late arrival of the Khashoggis; and a boat trip on the Danube. All of which was nothing more than a prelude to the main event, an 18th-century Don Giovanni-themed costume ball at which rock stars and royalty sporting powdered wigs watched the princess, dressed as Marie Antoinette, sing ‘Happy Birthday’ à la Marlene Dietrich. Following a decade of estate mismanagement, the fairytale ended when Prince Johannes died in 1990 after undergoing two unsuccessful heart transplants, leaving the princess more than half a billion dollars in debt. Studying economics and tax law with private tutors, a new Gloria emerged as she took over the running of the behemoth estate. Companies, castles and jewellery, as well as 24 of her 27 cars, were sold — and the palace sta , which included 80 liveried footmen, was slashed. After 10 years of retreat and regrouping, Princess TNT had turned the family nances around.